In this tutorial we will show you how to install Skype on your Ubuntu 18.04 LTS. For those of you who didn’t know, Skype is one of the most popular communication applications in the world that allows you to make free online audio and video calls, and affordable international calling to mobiles and landlines worldwide. Skype also offers some rich features like voice mail, video chat, instant messaging, call forwarding, conference calling and many more. This article assumes you have at least basic knowledge of Linux, know how to use the shell, and most importantly, you host your site on your own VPS. The installation is quite simple and assumes you are running in the root account, if not you may need to add ‘sudo’ to the commands to get root privileges. I will show you through the step by step installation Skype on a Ubuntu 18.04 (Bionic Beaver) server. Step 2. Installing Skype on Ubuntu 18.04. Congratulation’s! You have successfully installed Skype. Thanks for using this tutorial for installing Skype on your Ubuntu 18.04 system. For additional help or useful information, we recommend you to check the official Skype web site. 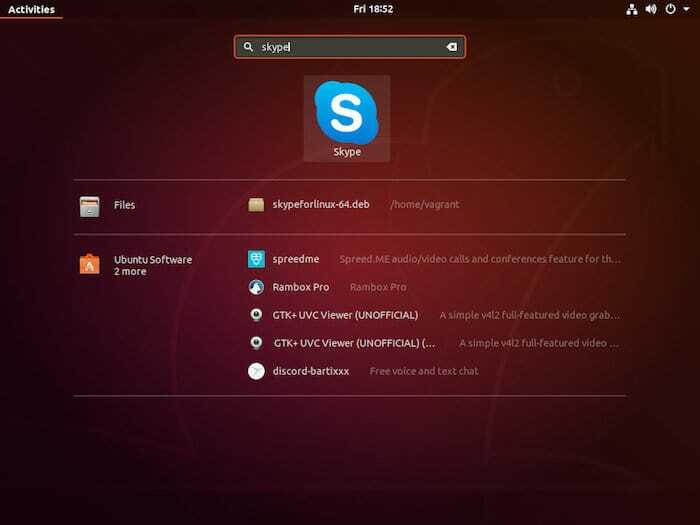 Related Posts of "How To Install Skype on Ubuntu 18.04 LTS"